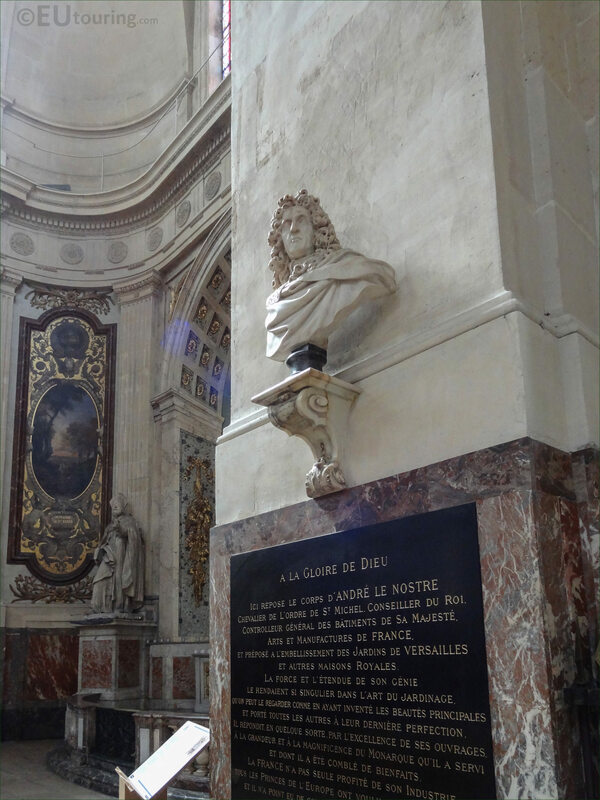 While we were visiting the historical Eglise Saint-Roch, located on the Rue Saint-Honore in the 1st Arrondissement of Paris, we took these high definition photos showing the bust of Andre Le Notre, which was sculpted by Antoine Coysevox, and is part of the funerary monument dedicated to this famous landscape artist. 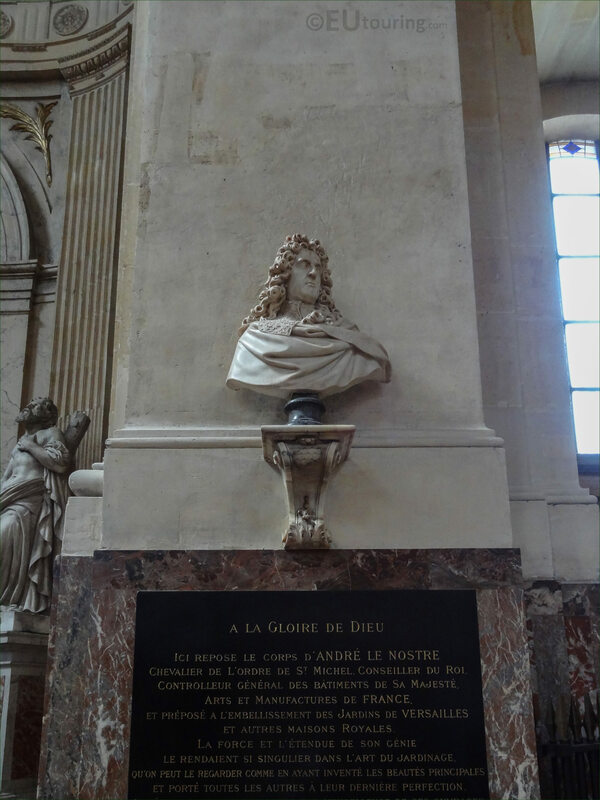 This first HD photo shows a bust of Andre Le Notre, who was born in 1613 and became one of the greatest landscape architects designing the gardens for the Chateau de Versailles, Chateau de Chantilly and many other royal residences, including the redesign of the Jardin des Tuileries, which is where you can actually find a copy of this bust. 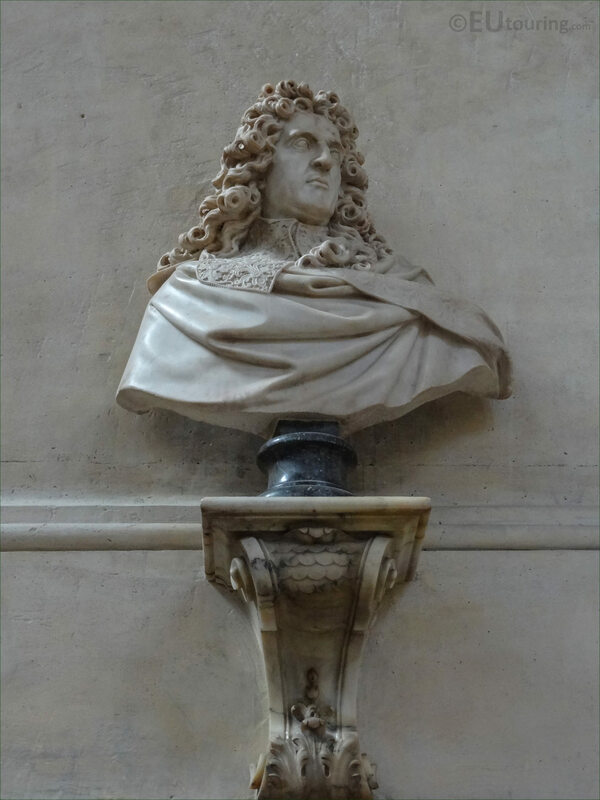 Now this particular bust of Andre Le Notre was produced in marble by Antoine Coysevox who was born in 1640 and became sculptor to King Louis XIV, producing numerous different statue groups for Versailles as well as the Chateau de Marly, yet he was also commissioned for many busts of famous people of his time, which included this one sculpted in 1700. Andre Le Notre, sometimes spelt Andre Le Nostre as you will see in one of the images below, was the landscape architect that perfected what was to become known as the Jardin a la Francaise with formal patterns, water features and other elements such as terraces, because his idea was for the gardens to be seen and enjoyed from above, as well as while within them. Yet a complete funerary monument was commissioned to Pierre Cotton by the widow of Andre Le Notre, for this to be placed in the first chapel of the deambulatory of the Eglise Saint-Roch called the Chapelle Saint Vincent de Paul, and Pierre Cotton also worked on tombs for other people within different churches in Paris, such as one of the Eglise Notre-Dame-des-Victoires. Here rests the body of Andre Le Nostre Knight of the Order of St Michael. Counselor of the King, General Controller of the Buildings of His Majesty, Arts and Manufactures of France, and prepossesses the beautification of the Gardens of Versailles and other Royal houses. The strength and extent of his genius made him so singular in the art of gardening that he can be regarded as having invented the principal beauties and carried all the others to their last perfection. He replied, in a manner, by the excellence of his works, to the grandeur and magnificence of the Monarch, which he served, and of which he has been overwhelmed with pains. 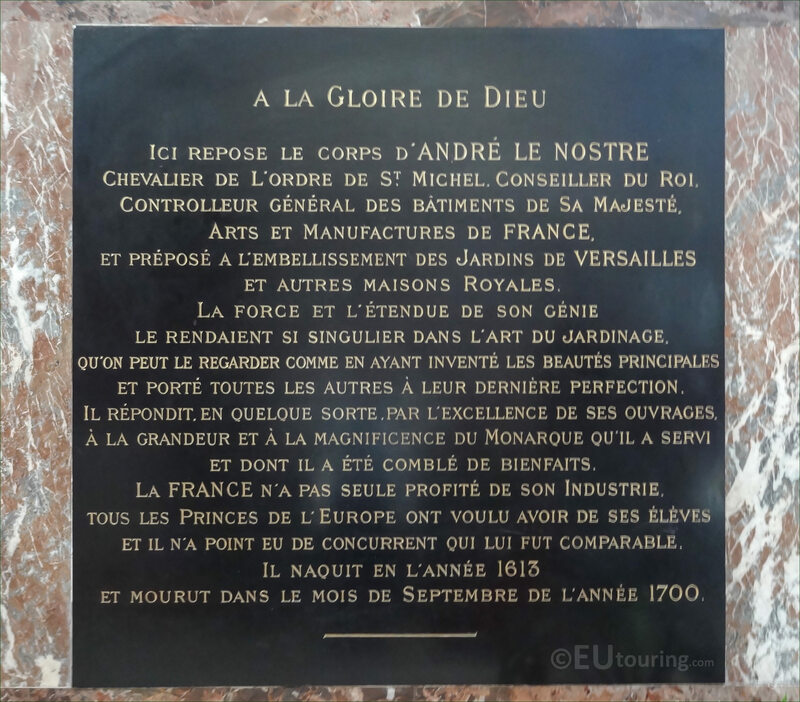 France has not alone profited by her industry, all the Princes of Europe have wished to have his pupils, and there has been no competitor comparable to him. He was born in the year 1613 and died in the month of September of the year 1700. 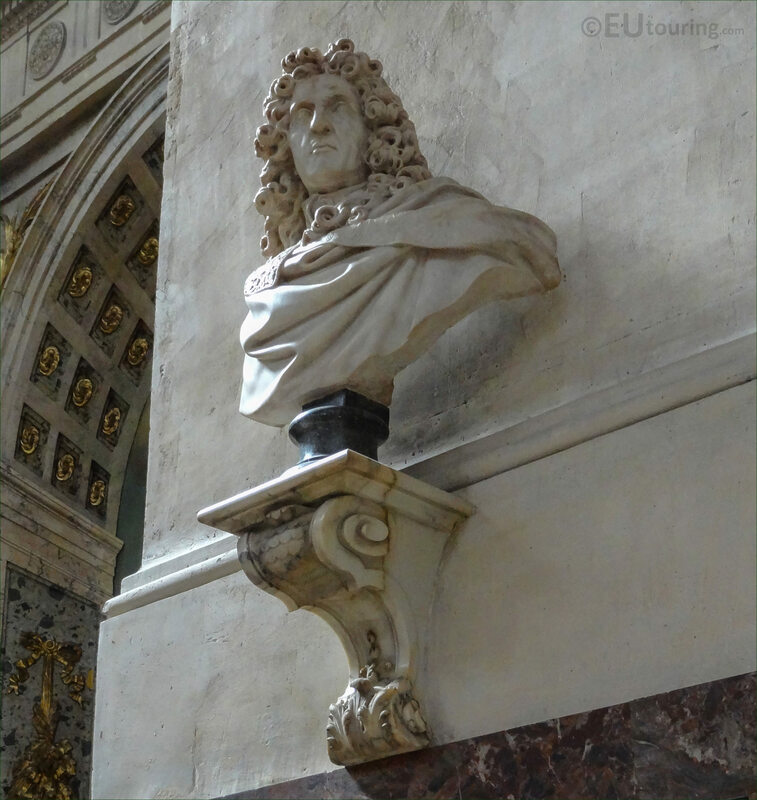 However, even though the originally funeral monument was produced in 1707 and included an allegory of the Faith holding an epitaph to the glory of the illustrious gardener, the only part that remains is the original bust this was one of the seizures during the Revolution and only the original bust remains after it became a deposit of the Musee des Monuments Francais. While it was within the Musee des Monuments Francais it was in a room devoted to the 17th Century, yet upon its closure in 1816 many monuments were returned to their original locations, which included this bust of Andre Le Notre, and a new plaque stating the words on the original epitaph was placed underneath the bust, which was put back within the Chapelle Saint Vincent de Paul in 1819 within the Saint-Roch church, where it has remained ever since. 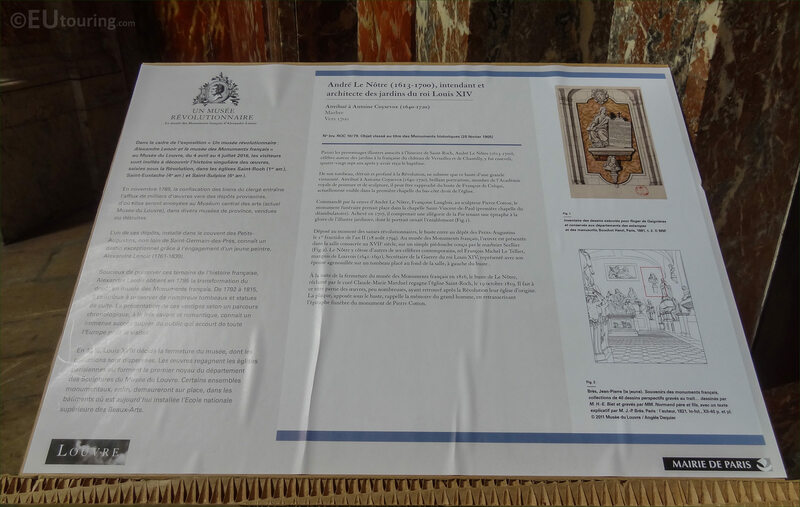 So this image shows a photo we took of the tourist information board providing even more information that was produced for the Eglise Saint-Roch in conjunction with the Musee du Louvre for an exhibition entitled Un Musee Revolutionnaire, and as you can see, this bust of Andre Le Notre by Antoine Coysevox has an inventory number of ROC 10/79 and was classified as an historical monument in its own right back in 1905.